What happens when you have to drive your electric-only Volkswagen e-Golf out of Hollywood to some inland dustbowl with no charger? You get creative. And you end up burning hydrocarbons anyway. Ace drift, rally and hillclimb driver Rhys Millen spotted this e-Golf getting juiced up from a Honda generator, furiously clattering away as it sucked down gasoline to power this Volkswagen. The Honda EU2000i we’re hearing hammer its little heart out pushes 2000 watts/120V volts out for a little over eight hours with one gallon of gasoline. Honda says it’s designed to power a TV or fridge. I’m not sure exactly how easily it could replenish this Volkswagen’s 24.2 kWh lithium-ion battery, but the car is supposed to take 20 hours to recharge its 83-mile range at at 110 volts. 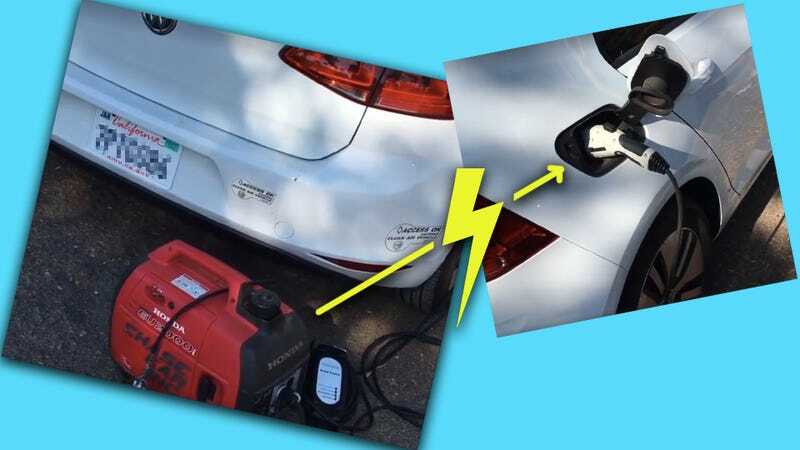 Now I didn’t pass calculus per se but I think that translates to something like 2.5 gallons of gas burned in the generator to charge the e-Golf all the way? 33.2 MPG? We’d have to think a lot harder to work out the emissions equivalent, but suffice it to say this is not the intended usage of either Honda or Volkswagen’s technology. Millen says “Hollywood people make me laugh.” True, they can be silly, but if you’d rather give this car’s owner the benefit of the doubt maybe their commute is usually within the car’s safety net and at least they still showed up to work!